When our design team of PGA professionals and foot and ankle surgeons took an in-depth look at the mechanics of the golf swing, we had to base everything obviously on the fundamental role of the feet, ankles and leg muscles during the golf swing. We analyzed a lot of the top players in the modern game as well as the past. Of course, we had to come to terms with the fact that no single golfer swings like the next, but when we looked at thousands of swings of many of these top players, we could see that, when it came to the biomechanics of the feet, ankles and legs, they were all amazingly similar. This is what gave us the initiative to create an orthotic capable of enhancing these techniques for the normal amateur player. The tendencies showed that accomplished players give themselves more time to negotiate the transition when compared to amateur players, who are generally way too fast and lose their timing. Our data showed us that the key to effortless speed has a lot to do with better footwork. Our thought process naturally went to creating an orthotic that could help golfers position their weight better to promote the engagement of the muscles in their ankles, thighs and hips, resulting in a much-improved technique. We have to introduce the basics of biomechanics as they relate to the athletic movement in the golf swing. Specifically, we have to focus on the weight shift within the action of winding and unwinding the body, optimizing what we should term “dynamic balance” for the efficient delivery of club head speed and power. When a coach talks about the importance of building a swing “from the ground up,” he or she is referring to the unavoidable fact that we play this game with both feet on the ground. There is simply no escaping the fact that the quality of our footwork — our interaction with the turf — is vital to the chain of movement. 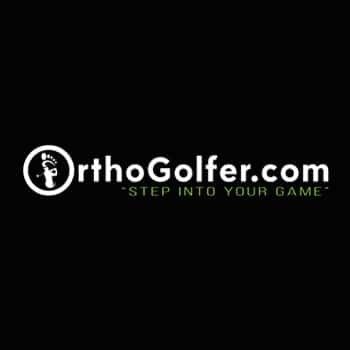 In addition to being a financial sponsor for Caddy For A Cure, OrthoGolfer is a caddy bib sponsor for the Caddy For A Cure program participants.